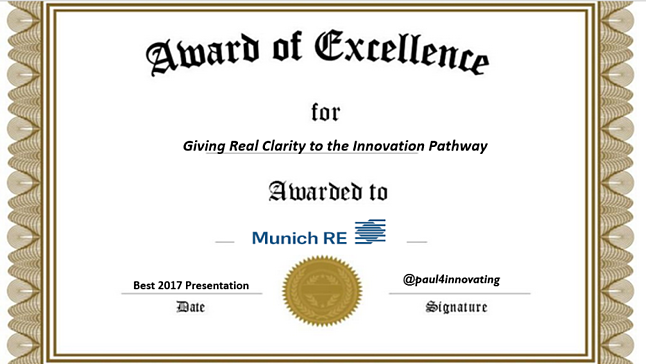 The most impressive presentation I reviewed in 2017 was the one from Munich Re, held on 21st November 2017 on their investor day. I can only touch on it here and suggest, you do your own drawing of conclusions. The insurance industry has been struggling to adjust and adapt their business models to the rapid changes occurring, yet so many are hanging onto the traditional way of doing things. 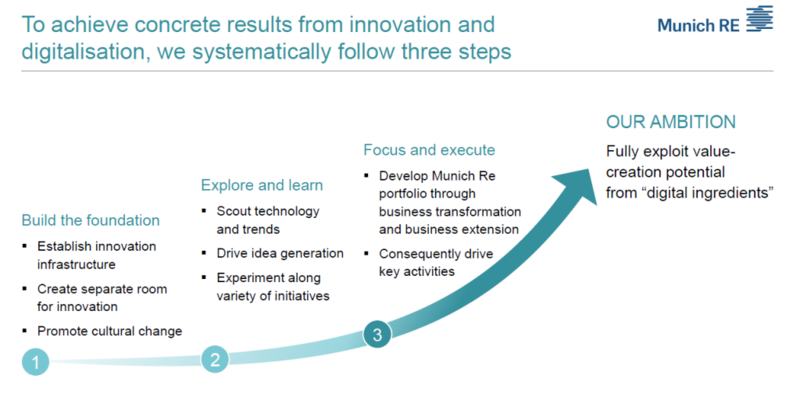 It is so refreshing to see how Munich Re are venturing out, exploring and exploiting in multiple ways how to develop a new innovation pathway. I have been following these two big Re-Insurers, Swiss Re and Munich Re, specifically and the innovative differences are quite significant. Swiss Re seems to be locked far more into traditions and I am still convinced they have to embrace innovation yet, certainly from an external perspective, in the same way as Munich Re is undertaking it. I struggle with Swiss Re’s messages on where they are exploring the future of insurance. The way I see things, it seems far more unclear, even random, they seem far more closed down with isolated attempts to explore opportunities. Whereas Munich Re is constantly opening up itself to change, by exploring, seeming far more comprehensive and holistic. It looks like, one is undertaking “words are simply spoken” while the other goes for “actions underscored”. But maybe I am wrong. The reason I consider the Investor Day presentation as really valuable and good, was its comprehensive coverage of the way how the people involved in that day covered the framework and infrastructure initially, then explained through different examples their business transformation journey, and how these parts are extending out for their total offering, in exploring new business models and solution offerings. If only the vast majority of corporate organizations could set about describing their transformation in such a concise and visual way, it would give such a raise on the clarity of what is being explored, experimented with, and embedded, besides showing clearly if innovation is central and core, or simply given “lip service”. All I can achieve here in this post, is first, a real praise for the presentation and provide just a few ‘teasers’ from a presentation deck that is 140 slides long. You get such a strong feeling of how digitalization and innovation are being combined in new ways. They do not only provide a foundation and a clarification of where innovation fits but they also provide a clear outline of the ongoing progress and the results to date. 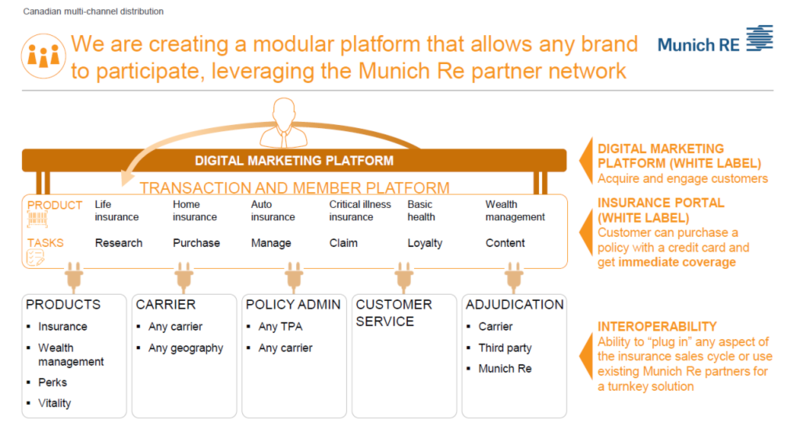 Munich Re is “forming an interlocking business model” in what they are currently undergoing. One that is providing a growing range of digital solutions and indicating how active they are in continuously transforming and extending their business. They take this opportunity to discuss the level of detail through selective projects, giving you a good undercurrent of their commitment and belief, in the transformation they are undertaking, one of searching for innovation synergies in all of what they are exploring. They are striving to enable technology and digital innovation to improving their 1) existing business models, looking to 2) disrupt existing business models and 3) establish new business models in selective insurance sectors, to continuously learn and adapt. This updating is on sales, retention and service outlooks. 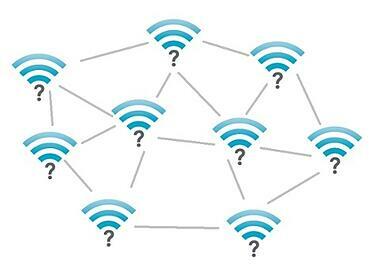 They also want to ensure a “best user experience” whereever they can through digital and customer-centric platforms. They are also looking for becoming, where possible, the virtual insurance company from what they are learning and experimenting with. As in many other industries, Munich Re is building a new digital factory that taps into the trends occurring across industries (Industry 4.0 for example) and in managing risks in different ways. They are looking to work through new risk scenario’s, extend insurability and risk mitigation or prevention, add new products, solutions, and new extended services and open themselves up to a more hybrid customer ecosystem, serving across multiple channels. All of this with the aim of having efficiency increases and growing automation. Within this Munich Re have recognized that the transforming occurring across industries from standard products, established borders is requiring different system solutions and different investments. Part of this set of solutions is building out the digital ecosystem they see as essential, where data analytics, predictive analytics and basically looking to further exploit turning data into value and risk assessment becomes paramount. The mix of digital ingredients and having the approach to building a more agile, flexible and modular design approach gives a strong impression they are driving much innovation within the Insurance Industry. As they continue to make further strategic investments in their innovation they will continue to push the boundaries for transforming the industry. For example, they illustrate the Canadian approach to their digital marketing platform. Without a doubt the presentation was well-structured. It shows this is a journey they are embarking on and you get that clarity from the commitment from the top in exploring avenues that can lead to new opportunity or new learning. 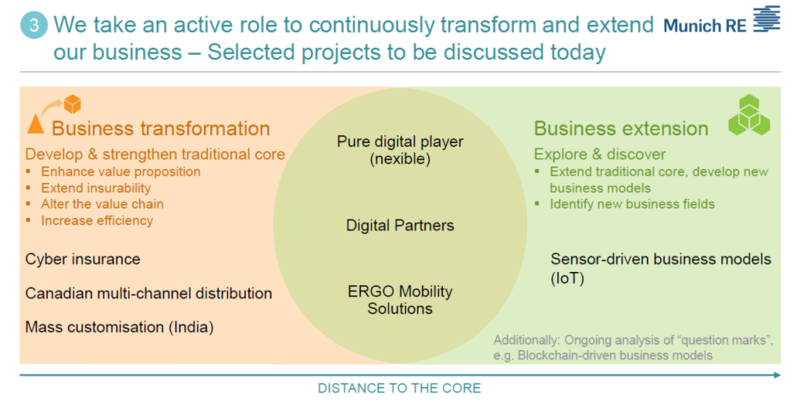 This is no finished roadmap but it does give investors and multiple stakeholders a really decent understanding of how Munich Re is managing their transformational journey. In a further update in January 2018, I have lifted out this slide from the Equity Story on why you should invest in Munich Re. Two points come across, a vigorous management attention and a strong attention to a cohesive business strategy that explores transforming ideas into tangible results in investments, experiments and learning for moving towards a tangible business impact. 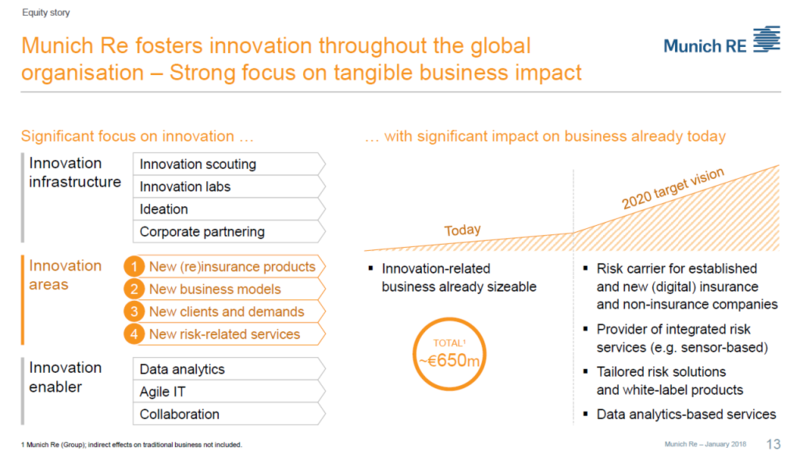 The whole value of approaching the story of innovation in this way, provided by Munich Re, can be such an example to so many others, a template for communicating out the digital innovation story. 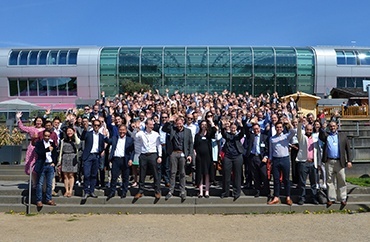 It strikes me that Munich Re is recognizing and embracing the changing competitive landscape, they see digitalization fostering innovation, they are learning to figure out what are agile business models that give them a growing awareness, preparedness, and resilience to try to contain and dampen down all the volatility around them. They are clearly in search for a business-enabling set of new business models, that is a work-in-progress that does, in their own words “turn uncertainty into business opportunities”. Thank you, Munich Re, for such a great presentation and the continued message this is simply not a one-off presentation. 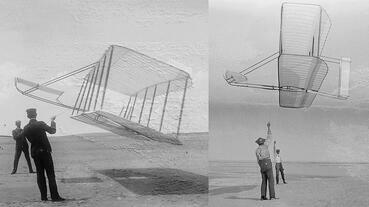 As I have seen previously seen, they are constantly reinforcing their innovation transformation message. This has already gone into 2018 in the recent Equity Story, just released even further in qualifying innovation impact (see above). 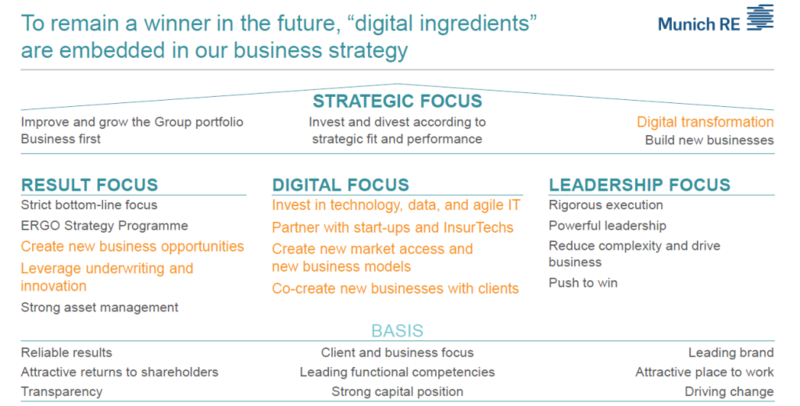 They are clearly showing a strong confirmation that the “digital ingredients” are embedded in their business strategy to search and explore, as well as exploit innovation. Others might be well-advised take their time to reflect on their approaches to the future and how they are undertaking any digital transformation and where innovation does sit in this. “Sitting on your hands” or treating business in that past, traditional way, of doing business as usual, is not an option. The lessons you can learn from Munich Re, who do seem to understand this well and explain how they are undergoing their transformation journey through innovation is really good. A terrific confidence builder and validation of actions. This blog post was previously published on Paul Hobcrafts website paul4innovating.com. 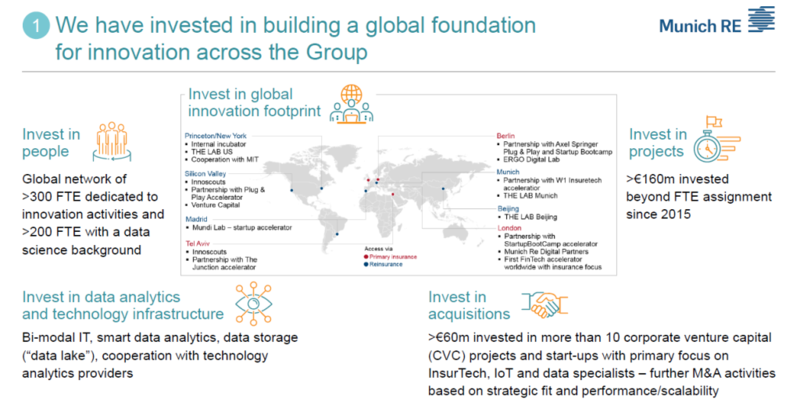 *All visuals used came from a Munich Re investor day presentation in November 2017 “Munich Re driving digital transformation” or the last slide for an early 2018 update in Presentations 2018, on Munich Re under “Current Company Presentation” under “Shaping change in insurance, Munich Re equity story” a download PDF, 1.5MB. Both of these released into the general public domain from their publications section.